African American Brides Blog: Bridal Nail Polish Giveaway! It's no secret that more and more brides are doing their wedding day nails themselves these days. Our take on this trend? Go for it! Anything is possible when you have the right products and tools. 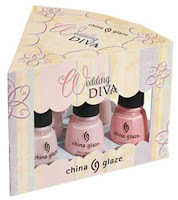 China Glaze is making it possible for one of our lucky readers to win not one but FOUR beautiful bridal shades in this week's giveaway. The colors are "Diva Bride", "Cheek to Cheek", "White on White", and (our favorite below) "Garter Belt". Just leave a comment here on our blog this week to be entered. It's that easy. The winner will be determined by random number generator and announced next Monday. So don't miss out! I absolutely loooove China Glaze polish. These colors are so pretty! I wish I had the skills to do my nails myself, but I think I will leave it to the professionals for the big day. I would love to practice though!! All of the colors are pretty, but I also love Garter Belt! Diva Bride is for me ! !